There’s no specific point to this post, but for a few days now, I’ve wanted to write something for my blog, and thus, here we are, dear reader. It’s just that time of the year, I guess; a blank page and hours to spare. Themes or no, after nearly three years of doing this, I can’t help but feel a tug at my heart to say at least something before this year’s end. So, here we go. Perhaps the logical thing for me to do would be to write a year-in-review list or some other vague spin on that lovable tradition of anime blogging? But I don’t feel like doing that this time around, I’m more concentrated on what I’m watching right now, like Legend of the Galactic Heroes. It’s perfectly apt that the last anime I’ll finish in 2008 will be the one I’ve been locked in battle with since March. I’ll probably be relieved once it’s finally over, but probably a tad nostalgic too, because it’s always with such a bitter-sweet feeling that I let go of a story after such a long journey. Another of those bitter-sweet journeys was Toward the Terra, which, I’m excited to note, I’ll (hopefully) be revisiting over Christmas via the original three-volume manga series, To Terra. I’m finding that my fascination with this story is an odd thing, really. It’s not easy for me to pin down either, but considering my feelings for a while, it may have something to do with the flow of time within the story. Like in Gurren Lagann, where the characters seem to visibly age, grow into better people or terrible villains, but always changing. The same can be said of the thousands of years that pass between the stars in Gunbuster, or in Orson Scott Card’s Ender’s Game. Such a clear and inevitable sense of flowing time, the characters’ lives, their dreams and ambitions, as brilliant as they may be, are so immensely small and ephemeral when set against the sheer magnitude of space and time. In such obscurity, it would be easy to give up, but these characters never do, they keep on going. For me, that’s such a comforting sentiment, especially at the close of another year, where the subject of time progressing is literally the reason to party. So, if you celebrate it, I hope you have a great Christmas and, of course, a happy new year too. Ah, go on then, what did you get for Christmas? I hope you gave some awesome gifts, too? 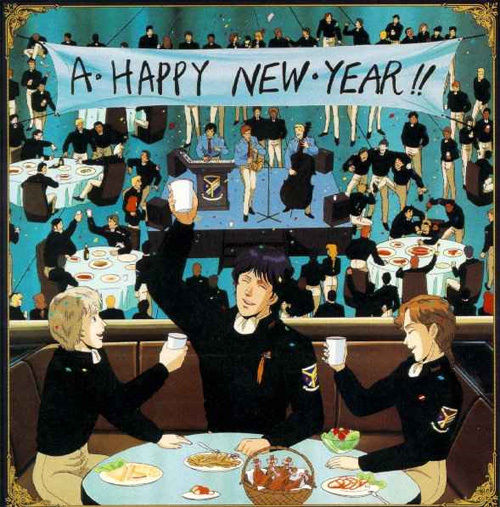 Good luck finishing LotGH – I felt strange when I finished it, simply because it’s rare to spend that long going through any kind of story, in any medium. As for presents, it’s three o’clock in the afternoon and I still don’t know what I’ve got, as my family have not yet started opening them. So much for the ‘season of self-indulgence’ . . .
A joyous and lively Christmas to you and to everyone on board! What a fitting picture, perfectly describes that feeling of being able to let go and enjoy yet another end to a fine year (of anime sure, and of course much much more). Rarely do shows with episode counts reaching up to 13-26 episodes have any lasting appeal on me. They have to be excellent to achieve such a feat (Gurren Lagaan comes to mind). I think 50 episodes is the ideal episode count for people to be able to connect with the characters beyond that superficial level. As you start to invest more time on said characters you care more and when it happens (talking about the eventual death of an important character, assuming most great shows have some kind of important death scene) it hits you that much harder. Currently Xam’d is the only show thats making me feel anything remotely close to THAT feeling (Lots of great shows this season, sure, but Xam’d so far is the only show that resonates with me, on an emotional level), granted its only 24-26 episodes, it oozes quality and begs for attention, which it rightfully deserves. On a completely different note. Everyone loves a year-in-review post! Plus it gives you more time to think about what your next post is going to be about, since The year in review post is linear, usually. Maybe, just maybe? i can’t believe i finished Legend of Galactic Heroes before you did. i started three weeks ago. stop dragging your feet! the To Terra manga is excellent. Unlike alot of manga-to-anime adaptations; where i find myself strongly preferring one to the other, i like both Towards the Terra and To Terra equally. The manga’s art is particularly sweeping, and for me, underscores the emotion of the story. i don’t regret buying my set of To Terra manga. @IKnight – The tiny differences between everyone’s families are really interesting. I guess we all have our own traditions for Christmas! IIRC, you don’t have a TV either, right? Anyway, nice to see you’re back to blogging too. [There is no escape!] I’ll look forward to reading more from ‘ya. @Ivy – I’m in total agreement with your feelings on anime like Xam’d, and I haven’t given up all hope on a year-in-review post, because I know that many of you guys would like to read one. It’s just that almost everything I’ve loved in 2008, like Soul Eater, Xam’d and Casshern Sins, are still airing into 2009. I’ll probably look at this again, after I’ve finished watching a certain LotGH. @Celeste – You finished LotGH in THREE WEEKS? Impressive! I guess because I’m so close to finishing now, I almost don’t want to! Regardless, I’m thoroughly ashamed that it has taken me this long. Oh, and I’m happy to read that you liked the To Terra manga– I guess I’ve made the right choice, and, like you, find myself enjoying every iteration of the Terra story, as if they are each different enough to be worth investigating on their own. @0rion – Same to you. And, welcome back to anime blogging, too! Happy christmas to you as well. I must say I’m not catching up on things as much as I thought but eh, the festive holiday is all about relaxing at home with family (which I’m really enjoying). I’m sure I’ll resume LotGH soon but I want to finish Tytania first. Thanks for the great post. Keep up the hard work. Happy Holidays/New year to you too! 😀 Look forward to another year of anime and general procrastination :P. I try not to think of how minuscule my existence is within a broad perspective of life in general. I guess I’ll avoid anything that reminds me as such. And I don’t think I am ready to revisit Gurren Lagann, even in discussion, I am still recovering :(. how lovely that you’ve mentioned Orson Scott Card. He has been one of my favorite sf writers for a long long time. I’ve read Enders saga a few times, as a kid and even a few yeas back, always with the same sense of awe and bewilderment. Regarding the sense of passing time and death, as themes in anime, i’ve noticed that the autum season 2009 is quite abundant in such depictions, accentuated even, in series like Casshern Sins and Kurozuka, but you will not see me complain about that, I love a little angst and ontological panic 🙂 And yet, most curiously, I realised that what I really want from the new year, anime-wise, is a series focused on family ties, a real, remarcable slice of life, something with great personality, like Honey and Clover and such. I remember Orson Scott once said about Xenocid that it’s a text that rejected the overused notion of the lonely hero, a perpetual orphan teenager, always drifting from place to place, tied to nothing; and no matter how enticing that may be, like in Kino no Tabi, I wish the new nipon productions would amaze us once again with irrefutably beautiful works of art concentrated around the human side of things. There – I had my wish, I threw in my penny. 🙂 Have a wonderful year! @THM – Ahh, it’s great to hear from a fellow fan of Orson Scott Card (which, I must confess, was one of my secret intentions with this post 🙂 ). Ender’s Game is, quite possibly, my favourite book of all time, but then again, I loved every book in the Ender saga. At some point, I’m hoping to start on the Shadow saga too– I received Ender’s Shadow for Christmas. Thinking on the latter half of your comment (which, I have to say, is very thought provoking and beautifully written), I’m watching a particularly lovely series at the moment called Natsume Yuujinchou (translates to Natsume’s Book of Friends), which might fulfill your criteria of “irrefutably beautiful works of art concentrated around the human side of things”. It’s a very slice of life, Ghibli-esque fantasy about this ostensibly lonely boy who can see strange creatures and ghosts. I’ve found some of the episodes are very emotional and heart-warming, while others are, put simply, beautiful.